OMG. I LOVED this book. LOVED it. There aren't enough capital letters in the world to discuss just how much I loved this book. It was my very first Shannon Stacey book (I KNOW) and it did not disappoint, which is saying a lot since I've had it on my TBR pile since Netgalley granted my request to read it back in September. Yes, I have waited two months to read this. Two months. You do not know the kind of willpower I had to exert in order not to read it the moment it arrived on my bookshelf. I started reading it yesterday morning and read most of the day (when I wasn't shopping for the Christmas party I'm going to this weekend). I literally had to force myself to go to bed last night. As soon as I was awake enough to make sense of the written word, I powered on my Kindle and sank into the story (only popping up to eat and eventually catch another horrifying mass shooting, playing out on CNN). Jessica Broussard has never known her grandparents because her father always told her that they "weren't our kind of people," whatever that meant. Now, she has found herself flying across the country to cold and snowy Boston to help them figure out how to deal with the fact that they're getting too old to keep up with their big house. Rick Gullotti doesn't know how to feel about his landlord's beautiful granddaughter, who seems to have just fallen from the sky. To say they were surprised to find out she even existed would be the understatement of the century. All he knows is that the more he's around her, the more he wants to be with her, despite the fact that she lived and worked in San Diego. There are two types of fictional characters--the ones you don't mind spending a few hours with and the ones you wish were real, so you can meet them and make them your friends. Rick and Jess were the second type. I think I fell for them within the first few minutes of the book. It was easy to see things from both of their perspectives and even when they didn't agree on things, they still made sense. This is apparently the third book in a series (I'm going to have to find the others because this one was so good), but it can be read as a standalone. You don't need to know anything about the other firefighters in Rick's department (yes, this series is about HOT firefighters) in order to understand what is going on in Controlled Burn. The connections between the characters are made quite clear, so you know who everyone is, but Ms. Stacey doesn't get into the plots of the other stories. What surprised me was that this is a Christmas book. It starts sometime in December and there is a bit about buying a Christmas tree and part of it involves exchanging presents on Christmas Day. In fact, there was more of that holiday in it than in many of the books that were actually designated Christmas Stories this year. I did have one big issue with Controlled Burn and it was the fact that the ending just jumped out at me and nothing was resolved. Jess still lived in San Diego and there was still the problem of her grandparents' house. Obviously, she's going to move to Boston, and while I don't need it spelled out to me, they never even discussed it. It didn't make sense. That should have been a conversation that was had before their HEA. The fact that is wasn't is just weird to me. The last thing I want to know is where Joe and Marie live and how they afford a big house in Boston. I don't think we're ever told what Joe did before he retired, but Marie was a high school math teacher, so it is doubtful they'd have the kind of money it would take to have a house like the one we're told they have, especially since it was mentioned they lived close to Brookline. I lived in that area and it is not cheap. The houses are definitely big and judging by the house I was lucky enough to rent the basement apartment of, they're expensive as hell. I'd say my landlord's house was easily worth $2 million. Yeah, Joe and Marie had apparently lived there for a long time, but Joe mentioned having financial difficulties when Jessica's father was in high school. How'd they keep that house? I digress. 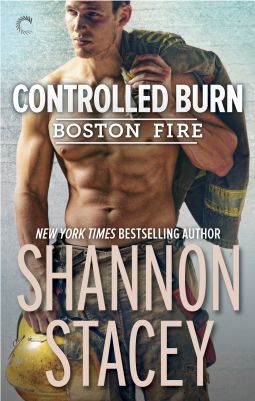 Controlled Burn was a fun, fast, and hot holiday read and I know I said something similar in my Christmas books post earlier, but if you buy one Christmas book this holiday season, it needs to be Controlled Burn (plus, Amazon has it on sale for $4.99! ).